We clarify and determine the essential mechanisms which lead high-efficiency solar cells and develop the advanced device processing technologies to overcome the difficulties, particularly for compound semiconductor thin-film solar cells, such as CIGS and CZTS solar cells. We also introduce the developed technologies to industrial sectors, and contribute to the development of solar cell industries in Japan. Developing the device processing technologies to realize high efficiency CIGS and CZTS submodules, particularly for flexible solar cells. We have made a number of essential reasons clear which prevent the solar cells from achieving high efficiency and obtained laboratory-scale CIGS devices with efficiency of 22%. 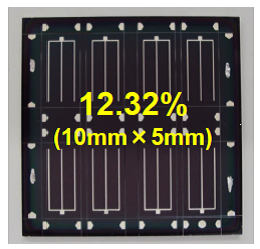 In addition, we have developed laboratory-scale indium-free CGS devices with efficiency of 11.0 %. These results strengthen the technological prospects of CIGS solar cells with high gallium concentration, which are expected as promising solar cells in the future. We have developed CIGS submodules using soda lime sheet glass as substrates and have obtained efficiency of 20.3%. The technology developed here is an important elemental technology to improve the conversion efficiency of CIGS submodules, and hence can be applied to large area CIGS modules as well as flexible CIGS modules. 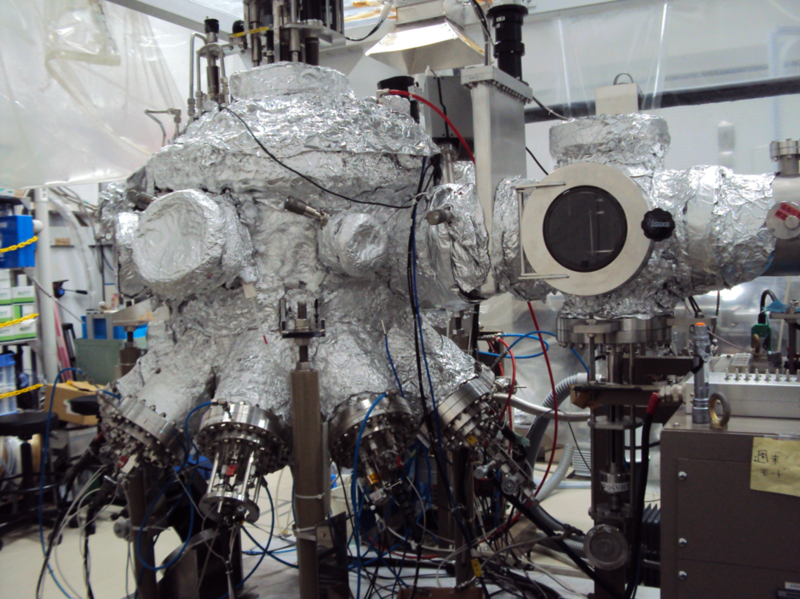 We develop laboratory-scale CZTS solar cells using Ge-doped CZTSe (CZTGSe) system. As the results, we obtained high open circuit voltage of 0.527 V and conversion efficiency of 12.32% at the alloy composition ratio of Ge/(Ge+Sn) = 0.2. 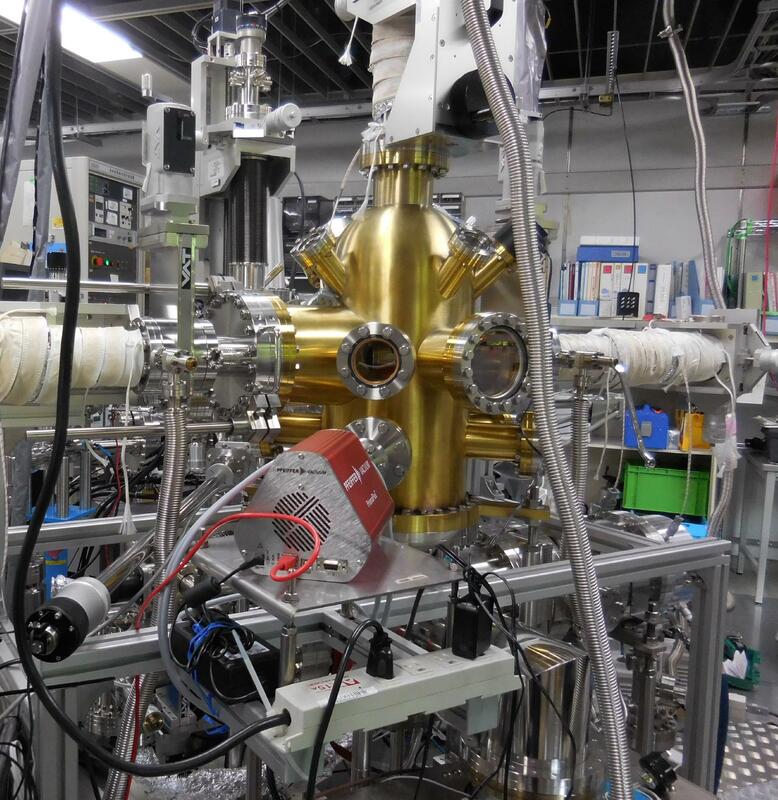 We develop new methods to characterize the electronic states of semiconductors for photovoltaics by combining both inversed photoemission spectroscopy and photoemission spectroscopy. 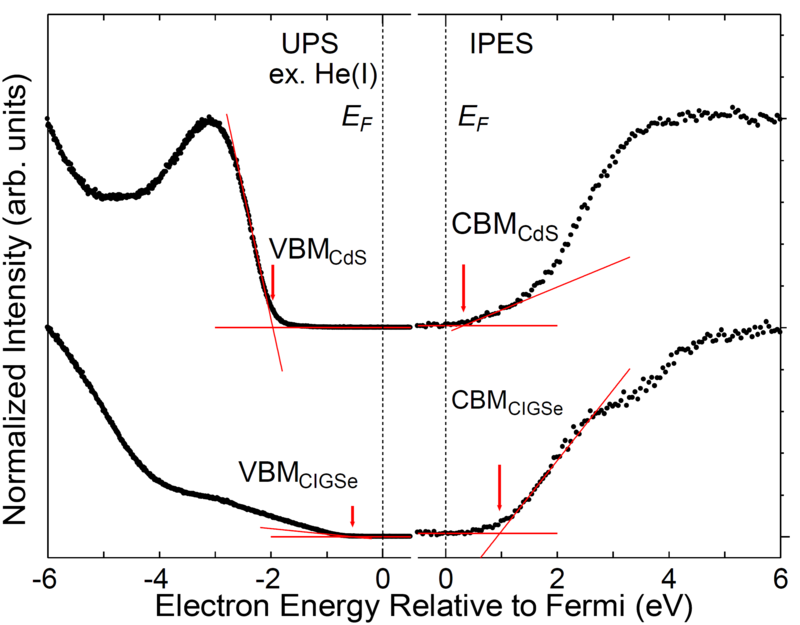 We can characterize both the conduction band and valence band of the sample precisely by the method. Fig. 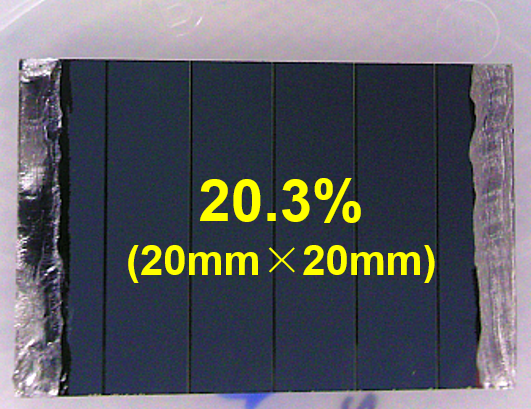 1 CIGS submodule with efficiency of 20.3%. figure. 2 CZTGSe solar cell with efficiency of 12.32%. figure. 3 Fabrication apparatus of chalcogenide solar cells. figure.4 Inversed photoemissions pectroscopy measurement system. figure.5 Inversed photoemission spectra (right hand) and photoemission spectra (left hand) of CdS and single crystalline CIGS thin films.